More than 100 international days are celebrated throughout the year, in recognition of a vast range of issues, occupations, activities and cultural values important to humanity. Forests have a link to almost all of them. 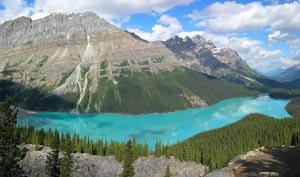 This page will feature forest links to these days throughout the International Year of Forests. FAO/FO-5744/Patrick DurstDeforestation amplifies risk for mountain communities. 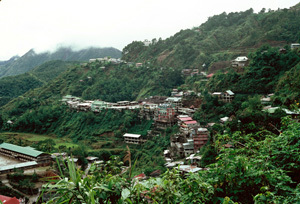 Landslide could spell disaster for the inhabitants of these precariously constructed buildings in Banaue, the Philippines. 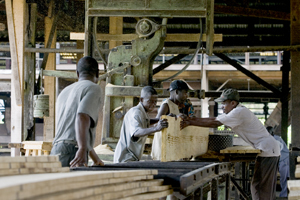 ©FAO/24683_0637/Giulio NapolitanoSus﻿tainable forest industry contributes to Africa’s development: men at work in a sawmill, Democratic Republic of the Congo. 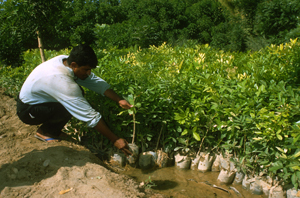 An FAO project in the country is helping to improve financial, scientific and technical capacity, including implementation of forestry research as well as efforts to improve infrastructure. FAO/FO-7084/ Ousseynou Ndoye In the Democratic Republic of the Congo, the leaves of Gnetum sp. 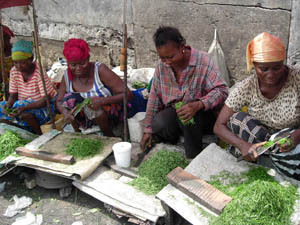 are consumed as a leaf vegetable and also provide revenue for women, further contributing to food security. 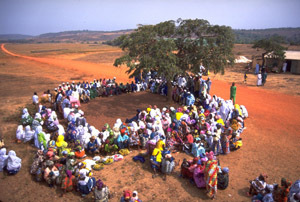 UNCDF/841/Adam RogersTrees are often gathering places for community democracy: a local government development planning meeting in Guinea, near Fouta Djallon. 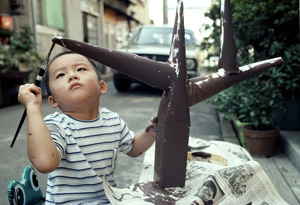 UN photo/70319/Jan Corash﻿Children are the hope for the forests of the future: a young boy paints a home-made tree in a Tokyo street, Japan. As the world becomes increasingly urbanized, it is more important than ever to educate city children about the importance of forests and trees. ©FAO/22118/Ros etta MessoriA nursery worker in Luxor, Egypt tends tree seedlings for use in sand dune fixation and afforestation, under an FAO project to improve plantation management in desert lands using available sources of water, including wastewater. The leading international organizations working to protect and manage the world’s forests are calling for governments across the globe to increase communities’ role in forest management. Doing so could contribute to lifting close to a billion people out of poverty, as well as improve the health and vitality of forests. 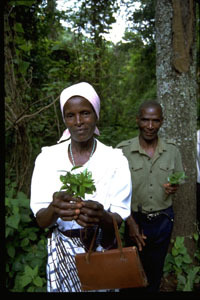 Forests and trees provide poor families with food, shelter, clothing and heating and also generate income through employment and through the sale of goods and services. Forests contribute to human health by offering pharmaceutical products and nutritional foods derived from forest products, as well as living environments conducive to good health. They also provide mental and physical health benefits as a setting for exercise and fresh air – especially for people who live in cities and have little daily contact with nature. 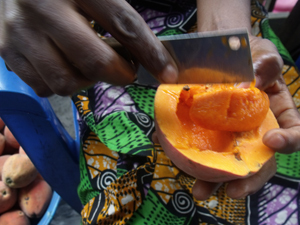 The nut or seed of Garcinia kola (bitter kola), for example, is used in Central Africa as a purgative, antiparasitic and antimicrobial. Throughout the world, watershed and riparian forests have an essential role in stabilizing water supply and ensuring its purity. 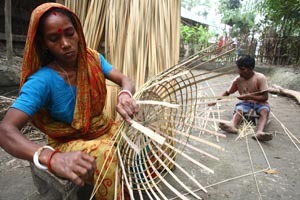 In Elisiya, Bangladesh, Alo Rani, 36, weaves a basket from bamboo, an important non-wood forest product. She received financial and technical assistance to develop her bamboo weaving business. 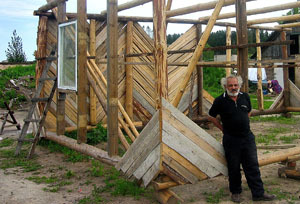 The International Organization for Migration (IOM) uses wood to help rebuild the burned house of a Roma ethnic minority, a victim of persecution, in Lithuania. Coastal forests are rich habitats for birds and sea creatures. Their leaf litter and detritus enters the marine food web. 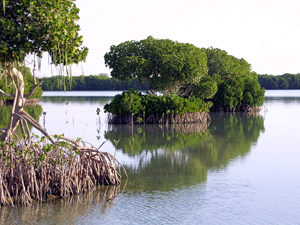 Mangroves, for example, serve as feeding, breeding and nursery grounds for numerous commercial fish and shellfish. They also offer protection against storm surges and erosion, helping to conserve wetlands and the livelihoods of people who depend on them. View a presentation of FAO's activities throughout the year. FAO inaugurates the International Year of Forests with a special photographic issue of Unasylva that illustrates these links. While the international days are the thread that holds the collection together, the organization is thematic, rather than chronological, the better to catalogue forests’ place in many sectors. The issue expresses the theme of the international year – “Forests for people” – by showing how forests are important to nearly all kinds of human activity.